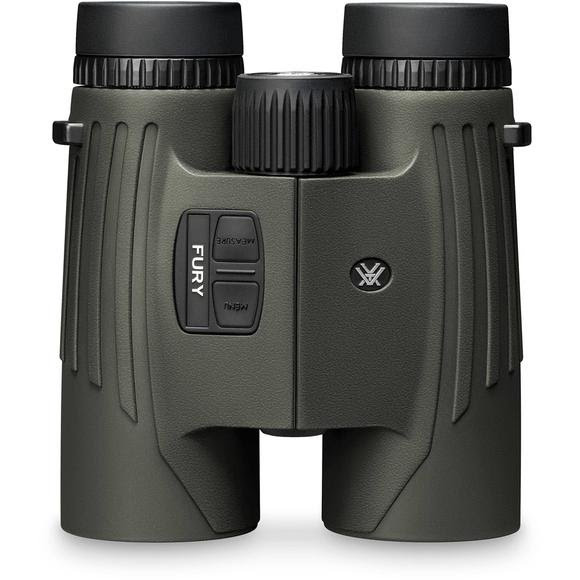 High quality optics and long-distance ranging capability come together in Vortex's Fury™ HD 10x42 Laser Rangefinding Binocular. Convenience, speed, efficiency, and valuable dual-purpose functionality, all the advantages of a high-definition binocular perfectly paired with an angle compensated rangefinder. High quality optics and long-distance ranging capability come together in Vortex &apos;s Fury™ HD 10x42 Laser Rangefinding Binocular. Convenience, speed, efficiency, and valuable dual-purpose functionality, all the advantages of a high-definition binocular perfectly paired with an angle compensated rangefinder. Right side controls are simple to use and easily manipulated with a single hand, leaving your other hand free to hold your bow, rifle, or other important piece of equipment. Vortex proprietary XR anti-reflective coatings, fully multi-coated on all air-to-glass lens surfaces, increase light transmission for maximum brightness. Used on roof prism models only coating enhances resolution and contrast. Nitrogen gas purging guarantees superior fogproof and waterproof performance. Provides a secure, non-slip grip, and durable external protection. Twist up and down to precise, intermediate settings to maximize custom fit for comfortable viewing with or without eyeglasses. Can be set to yards or meters. Simple to use and easily manipulated with a single hand, leaving your other hand free to hold your bow, rifle, or other important piece of equipment. Fit naturally for greater viewing comfort. Adjusts for differences in a user&apos;s eyes. Located by the center focus wheel. Compatible with a tripod adapter, allowing use on a tripod or car window mount. Adapter sold separately.